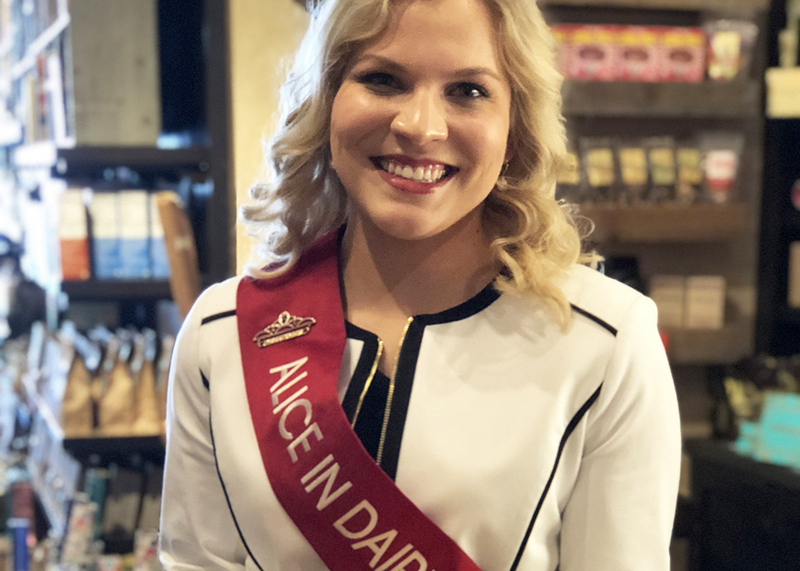 On Saturday, May 12, Alice in Dairyland will visit the Fromagination shop. Good question. Here in Wisconsin – “America’s Dairyland,” according to our vehicle license plates – there is a public relations professional employed annually to promote state agriculture. This year, Crystal Siemers-Peterman, from Cleveland, Wisconsin and a recent University of Minnesota graduate, is Wisconsin’s Alice. She contacted Fromagination recently to ask us how to put together a cheese platter. Then she followed up with a visit to our shop to get a quick lesson from our cheesemongers, first talking with Shannon about how to arrange a cheese platter. Then she talked with Jeff, whom she asked about a famous local, product, cheese curds. Tomorrow, Crystal will be providing information about Wisconsin’s dairy industry, including basic milk and cheese information for children. She has a degree in Agricultural & Food Business Management, and has been an intern for Sassy Cow Creamery, Land O’Lakes, Inc., and an advertising agency. Now she is finishing a year of promotional work across the state. According to the Wisconsin Department of Agriculture, Trade, and Consumer Protection (DATCP), “Each year, Alice in Dairyland travels more than 40,000 miles throughout the state, promoting Wisconsin agriculture to various audiences. Additionally, she conducts hundreds of media interviews, speeches and school presentations.” A new Alice will be chosen in June for the coming year. The Alice in Dairyland program has been around for 70 years, and Crystal has helped provide educational for 10,000 4th grade students, with support from the Wisconsin Milk Marketing Board. Come in tomorrow to talk with a bright, young professional who wants you to eat your cheese! This entry was posted by Kyle Richmond in News & Announcements and tagged Alice in Dairyland.